is situated in the west of Great Britain. It is a hilly and mountainous country and Snowdon, the highest peak, is in the Snowdonia national park in the , north west. Most of the population and industry is in the southern valleys and along the coast. The chief cities are Cardiff, which was chosen as capi 919h71j tal in 1955, Swansea and Newport. 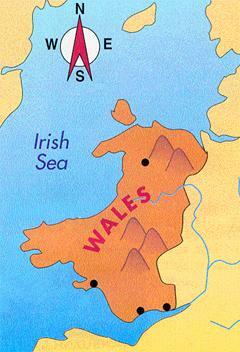 Welsh is an ancient Celtic language similar to Breton, spoken in Brittany, France. In the '60s Welsh was given equal status with English as an official language and is now used in the law courts; road signs are bilingual, it is taught in schools and some TV programmes are in Welsh. Wales is a land of legends - their heroes are famous for fighting the Saxon invaders. William the Conqueror did not attempt to conquer Wales though he gave the border lands to his lords and invited them to build castles and help themselves to Welsh lands. Edward I finally conquered Wales in the 13th century. The Welsh king, Llewellyn, was killed and Edward promised the people a Prince of Royal Blood, with spotless character, who spoke neither English nor French. He then named his one-week-old son the Prince of Wales! The tradition continues today; in fact, Prince Charles has the title. He takes his role very seriously and has even studied the Welsh language. There is a strong musical tradition in Wales: Welsh choirs are highly regarded in Britain and special festivals known as Eisteddfodau encourage the traditional arts of literature and music. Rugby may be considered the national sport. The traditional industriaI activities in Wales were based on coal, iron, steel and tinplate. The depression in the 1920s and '30s led to high unemployment and a lot of emigration to London and other English cities. Now most of the coal-mines have been closed. However, Wales, like Scotland, has become an important centre for electronics and high technology industries. Financial and busi- ness services are also expanding rapidly. Agriculture is stilI a vital part of the economy, accounting for about 80% of land use. The main activities are sheep and cattle rearing in the hill regions and dairy farming in the lowlands. Timber production is also significant, accounting far about 20% of Britain's total. 1. Put the correct names by the dots on the map below. 2. Write in your own words how the Prince of Wales was chosen. a) Cmyru. b) Cymru. c) Cmruy. a) east. b) south. c) west of England. a) is b) has been c) was the capital since 1955.
a) greater. b) less c) equivalent.